* At this time, Unity plugin supports Android only. iOS will be supported soon. Open your Unity project and double click tnkad.unitypackage file. You can see Plugin import window like below. 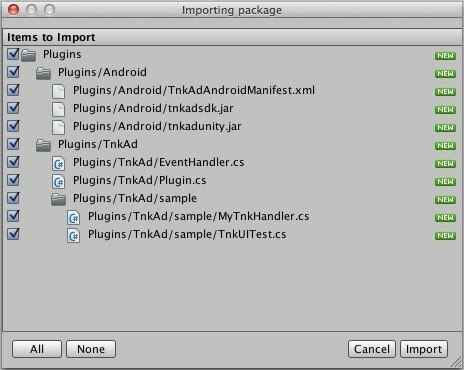 Check all items and click 'import' button to import plugin to your Unity project. You may already have an AndroidMenifest.xml file in your project, If so, just copy and paste the information from the TnkAdAndroidManifest.xml file to the relevant sections of your won AndroidMenifest.xml file. Put your AndroidMenifest.xml file in /Assets/Plugins/Android folder. Below is TnkAdAndroidMenifest.xml file. See the comments in the file and update your AndroidMenifest.xml file. Set permissions that TnkAd SDK requires. You can get App ID(Application Id) after adding your app in Tnk site. Put the App ID in <meta-data/> inside of <application/> tag at AndroidMenifest.xml file. In the sample below, replace your-application-id-from-tnk-site with your App ID value. Be sure that <meta-data/> tag must reside inside of <application/> tag. For publishing app, add following 2 activities. To collect channel data for ananlytics, you have to add a <receiver/> tag for INSTALL_REFERRER. If you are using Unity 4.3 or above version, you must set ForwardNativeEventsToDalvik option to 'true' in order to Java receive touch events. For advertising app, you don't have to change this option.